This incubator will appeal to the serious commercial poultry breeder who demands the very best incubator available that will produce outstanding results with the minimum of supervision. The Olympic 2200 will appeal to the serious commercial poultry breeder who demands the very best incubator available that will produce outstanding results with the minimum of supervision. All this set in an absolutely hygienic and easy-care plastic housing. Perfection "made in Germany" for the highest demands. This model has the addded facility of a water cooling system. This addition not only meets the requirements for use in hot countries such as Southern Europe, Africa or South America, but also means that outstanding success in breeding is also guaranteed during excessively hot periods in any country, including the UK, particularly where incubating rooms are not air conditioned. When brooding large numbers of eggs, from days 10/12 the embryos become exothermic, producing heat. If this happens during a hot spell this can raise the temperature to above the set level causing potential danger to the embryos. In these circumstances however, to prevent damage to the embryos, the water cooling system comes into operation and brings the temperature down to the set incubation temperature. If the incubation temperature falls below the set temperature, the outstanding HEKA microprocessor control quickly brings it back to the precise temperature that has been set. To operate the cooling water system all that is necessary is to just connect to the (cold) water supply pipe. The easy to clean and hygienic plastic cabin avoids damages caused by humidity. Just enjoy the best success in breeding, guaranteed by our HEKA microprocessor control system. This precise control system shows digitally in large illuminated figures: Breeding Temperature, Cooling Temperature, Humidity, Turning Frequency, Cool Down Temperature, Cool Down Time. All incubators in the Olympic series have a set of turning shelves into which either egg trays or hatching trays can be placed. These turning shelves are connected to a concealed motor that is barely audible. The trays tilt @ 45º forwards and then backwards, and are set to turn 12 times per day, but the timing is adjustable, and the turning can be deactivated for the final hatching period. 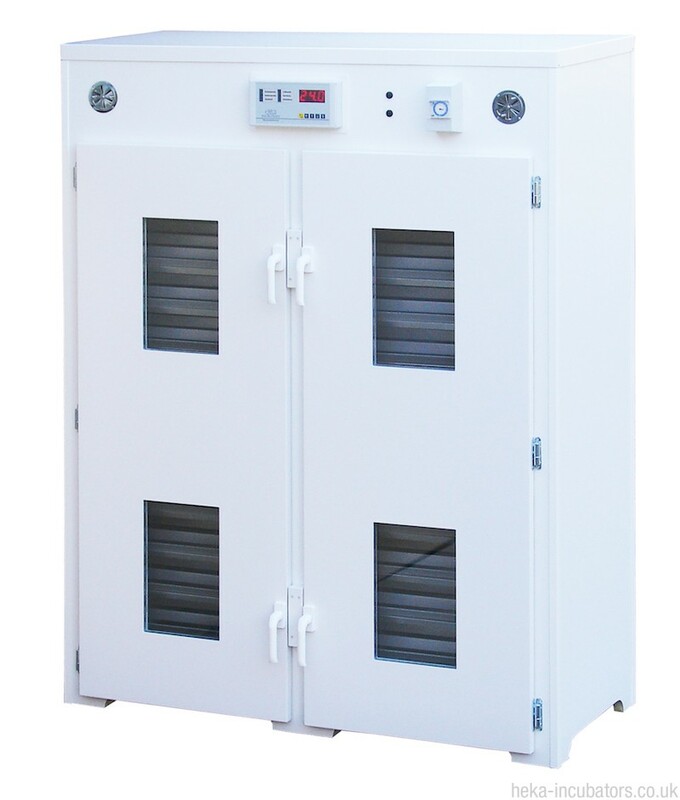 Temperature and humidity are shown so that you can check the precise regulation of your incubator at any time. Temperature, humidity, turning and cooling can be programmed with just a few key presses. All incubators in the HEKA Olympic Series are equipped with double glazing. The insulation value is much better in comparison with single glazing, and uses less energy. Also, insulated glazing does not begin to steam up until higher than ~80% humidity, and higher values are not normally required. The incubator is equipped with the following as standard; an interior light, twenty egg trays of your choice, a water canister, and a detailed user manual. Hatching baskets can be ordered as required. On request we can supply the incubator with connections for direct supply from the water main.